MICHAEL LEO BROTHERS was born on the distant planet of Massenia in a galaxy far, FAR away. When the planet became over-run with ravenous corgi dogs and sarcastic corpulent school marms, his family, to save his life (or so they would have us believe…) put him into a small rocket and blasted him into space. Falling to earth in a small and isolated rural town, he was raised by a friendly family of wild trout and eventually grew to manhood standing–up to his chin–in the water of a local brook. Tearfully leaving his adopted family for the lure of the auto reclamation business (and a nice dry shirt–though he still refuses to wear pants) he fell in with a group of renegade Swedish stockbrokers whose hostile takeover techniques taught Michael the futility of trying to sail a Viking longboat down Wall Street and ALL the lyrics to the Broadway hit “ANNIE”. After a terrible fight with this band of cutthroats and cut rate herring peddlers, he was broke, humiliated and left with a prosthetic forehead. Wandering aimlessly (a trait he was to hone to a science) he found himself in upstate New York, destitute, alone and still curiously damp. But Michael was NOT to be defeated! Summoning the hidden powers that are his otherworldly birthright, he began his long climb to world prominence! In a scant 10 years Michael has been able to buy his own pocket fisherman, watch the movie DRIVING MISS DAISY Three times and master the mysteries of the DAT machine remote! Joining with the other members of ANUBIS SPIRE after a chance meeting in a police lineup, he has continued to lend his incredible talents (and pocket fisherman) to the band! Drummer/percussionist Mick Loher wrote his bio below. “It’s been a blast teaming up with “The MacKechnie”. We hit it off right at first like two old cell-mates; joined together by our diversity, oddness, and of course, our good looks! It’s very rare for musicians to link together and Anubisize. I started out as a rudimental snare drummer in a marching band–the ORBITS–down in NYC. My first band took off when I was in the sixth grade. I was a kid of 12 or 13 and I was hooked. For me, percussion was part of being alive. I found everything had to have a beat. Recording, gigs, teaching school bands and just the desire to share this gift was my life. For me, the beat was always common but I viewed drums much like Mitch Mitchell, Joe Morello and Carl Palmer; a large canvas with two brushes and a picture to paint. So enough about me. 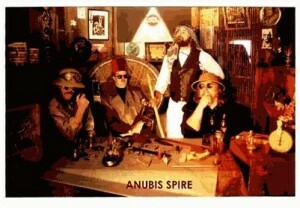 It’s been a big bang for me to be in ANUBIS SPIRE. All I can say is, check out our CD! Do you see the different pictures? WAIT!!! You must wear your tin-foil hats!…. Bill MacKechnie does not exist. And even if he did he’d probably be WAY too IRREVERENTLY HUMOROUS and self-deprecating for most people to understand or put up with!